There are 17 Shrimp Basket restaurants scattered throughout Alabama, Florida and Mississippi, but the eatery got its start right here in Gulf Shores, Alabama in 1993. They also have a location just down the road in Perdido Key, as well as in Pensacola, Florida, so you have several area options to choose from. Expect a crowd, and sometimes a line. Take heart in the fact that this a good sign about the food. 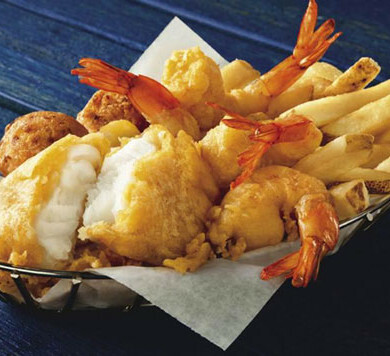 The Shrimp Basket menus are focused on locally sourced seafood such as shrimp, catfish, whitefish, crawfish, mahi, clams, oysters and crab, cooked every way you can think of, and served on platters or in baskets. Add tasty sides like steamed new potatoes, cole slaw, fried okra, steamed cabbage, buttered pasta, steamed squash, fresh corn and baked beans, and you’ll be all set for some serious chowing down. Make sure to wash it all down with one of their famous strawberry coladas. If you’re looking for sandwiches, they have ten different kinds of Po Boys. If you’re not a seafood fan, they do have a chicken sandwich. It is a family-friendly place with affordable prices and a kid’s menu. If you’re on a budget, check out some of Shrimp Basket specials, such as ‘all you can eat’ shrimp on Wednesdays and Sundays, ‘all you can eat’ fried fish on Mondays and Thursdays, and ‘all you can eat’ steamed shrimp on Tuesdays. You can dine in, carry out or enjoy their vibrant porch.